Radiotherapy (RT) is a commonly used adjuvant treatment modality for a variety of solid cancers. Up to 83% of breast cancer patients benefit from radiotherapy either with curative or palliative intent . Multiple studies, including 6 randomized control trials and subsequent meta-analyses, have shown that breast conserving surgery (BCS) followed by whole breast RT achieves survival rates and long term local control equivalent to that seen with mastectomy, with the added advantages of relatively mild toxicity and good cosmetic outcome [2–4]. However, despite the successful use of adjuvant RT in breast cancer, some patients will still develop loco-regional recurrences following the completion of a RT course. While tumour recurrence following RT can be due to residual disease or aggressive tumour biology, it can also be due to the survival of a population of cells that either have a greater intrinsic resistance to RT (e.g. hypoxic or cancer stem cells) or develop de novo resistance. These radioresistant cells can then repopulate the tumour site leading to recurrence and treatment failure. Only a small number of other studies have investigated mechanisms of acquired RR through the generation of RR cell lines, which tend to focus on a single specific pathway [7, 29–33]. 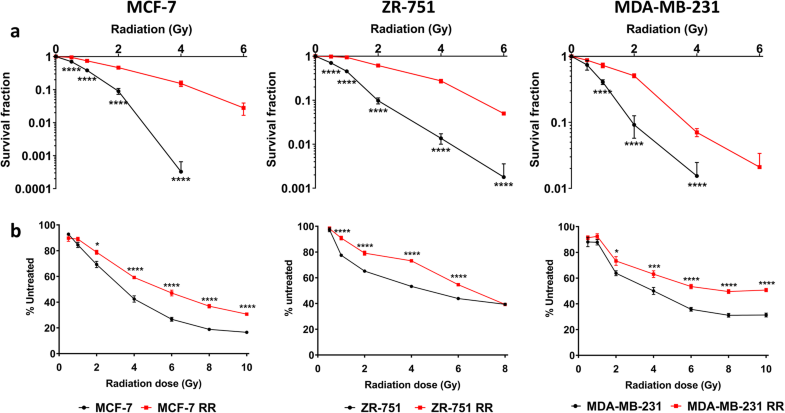 Reduced proliferation rates have been identified in RR cell lines ; reduced proliferation in our MCF-7 RR and ZR-751 RR cell lines was reflected in the gene expression profiles and reduced Ki67 expression in MTS. One study used 3 prostate cancer cell lines (androgen responsive and non-responsive) to develop RR derivates; they identified enhanced EMT/cancer stem cell phenotypes and activation of checkpoint proteins and PI3K/AKT/mTOR signalling pathways in the RR cells . 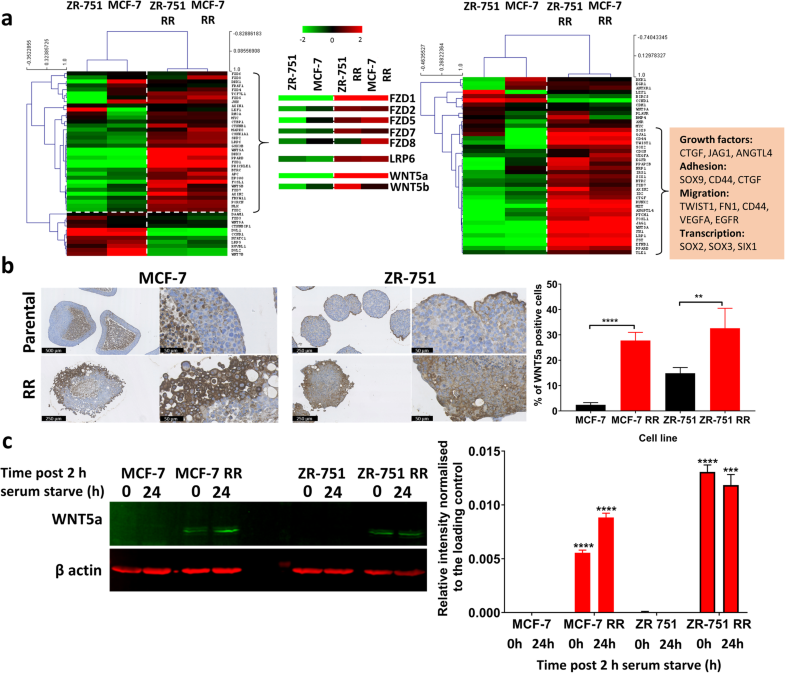 Our study took a similar approach by using 3 breast cancer cell lines, 2 ER+ and hormone responsive (MCF-7 and ZR-751) and 1 ER- and hormone non-responsive (MDA-MB-231). However, our approach was more global and investigated multiple potential radioresistance mechanisms rather than focusing on individual pathways. EMT is an important process in malignant transformation that leads to reduced cell–cell contacts, increased cell motility and metastasis [37–39]. Loss of epithelial morphology is an important prognostic indicator that correlates with worse prognosis . Hybrid/intermediate phenotypes show the ability of cancer cells to undergo EMT and mesenchymal-to-epithelial-transition, thus traversing the epithelial and mesenchymal states . 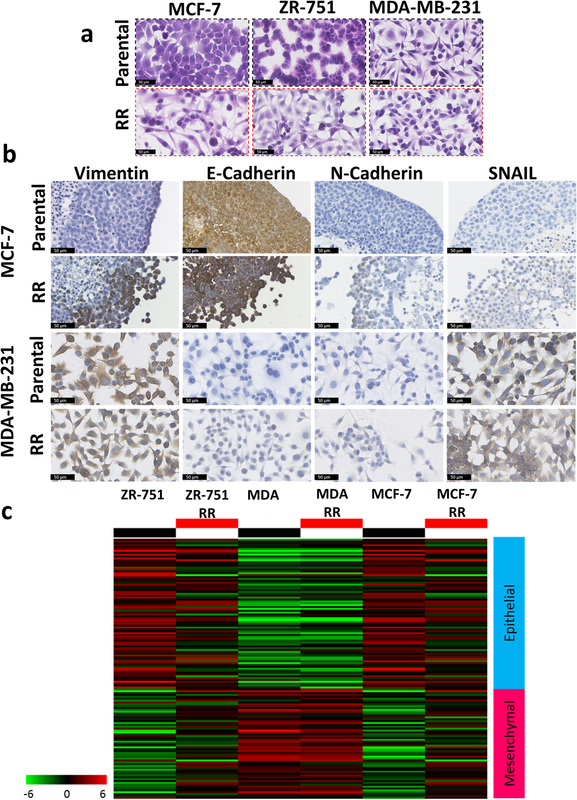 In our RR model we demonstrated a down regulation of E-cadherin and upregulation of vimentin, N-cadherin and SNAIL, all known biomarkers for EMT in breast cancer , in the MCF-7 RR and ZR-751 RR cell lines. These results support the morphological and functional changes in RR cells, which developed a more mesenchymal-like phenotype with increased invasive and migratory potential. The MDA-MB-231 cell line has previously been characterised as having a mesenchymal-like phenotype with constitutively low E-cadherin and high vimentin expression, so any further development of EMT in its RR derivative was difficult to ascertain. Many signalling pathways can activate EMT in both normal and cancer cells, including receptor tyrosine kinase signalling, TGFβ, Wnt-β-catenin and Notch signalling [42, 43]; radiation alone can also induce EMT through the expression of TGFβ [44, 45]. Both EGFR downstream signalling pathways and Wnt signalling were found to be activated in our MCF-7 RR and ZR-751 RR cell lines suggesting possible mechanisms by which the cells underwent EMT. It is interesting to note that the same population of cells, predominantly those around the periphery of the MTS formed from ER+ RR cells, showed increased co-expression of vimentin, Snail, N-cadherin and WNT5a. 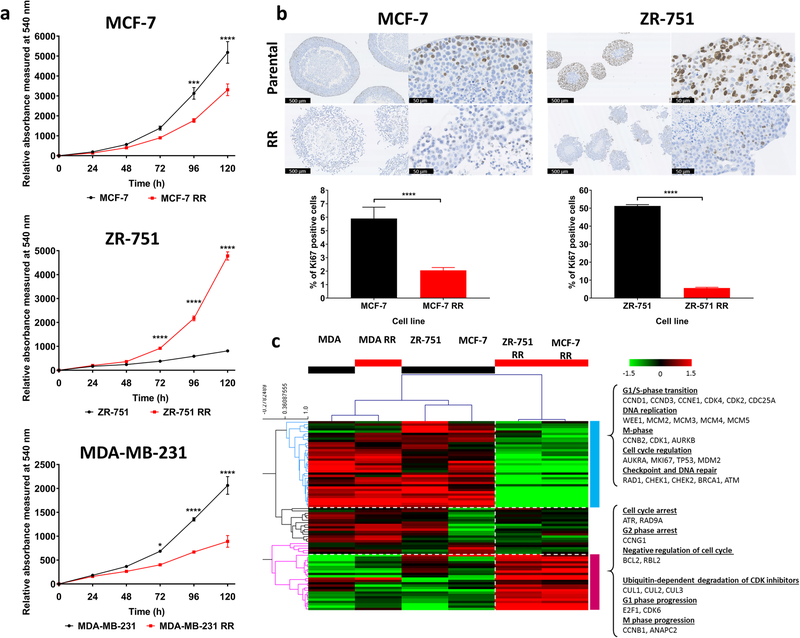 Analysis of protein expression indicated that both MCF-7 RR and ZR-751 RR cell lines lost both ERα and PgR expression and gained EGFR expression. 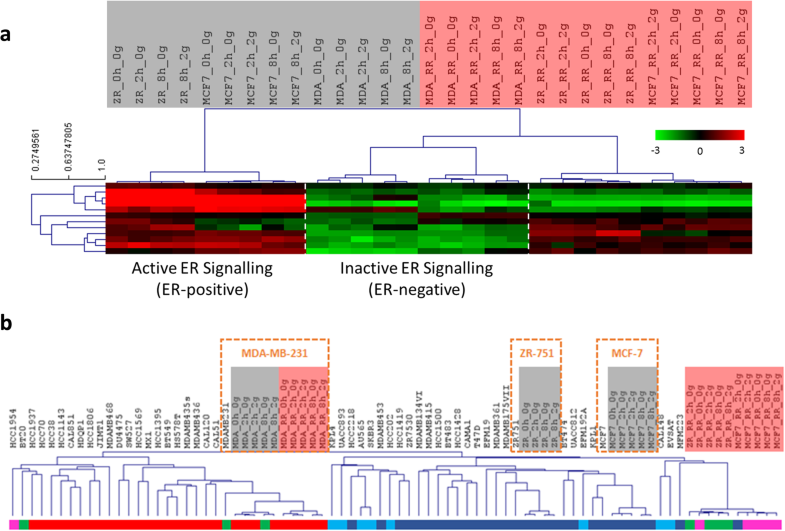 Furthermore, ERα siRNA knockdown resulted in increased EGFR protein expression in the MCF-7 cell line, suggesting a direct relationship between loss of ERα and increased EGFR expression. Using gene analysis, we further identified that ER driven genes had lower expression in the RR cell lines derived from ER+ cell lines. An inverse relationship between ER activity and EGFR and HER2 expression has been reported in clinical breast cancer, with overexpression of these receptor tyrosine kinases being associated with decreased sensitivity to endocrine therapy and a poorer prognosis [53–55]. An apparent switch from ER signalling to EGFR-mediated signalling was investigated by the treatment of MCF-7 and MCF-7 RR cells with the EGFR inhibitor gefitinib and the anti-oestrogen tamoxifen. Gefitinib produced a greater concentration-dependent reduction in cell proliferation in the MCF-7 RR cell line with an IC50 value of 6.43 μM. This is a relatively high concentration compared to clinically relevant doses [56–58]; however, while this suggests the MCF-7 RR cell line is relatively insensitive to the effects of gefitinib, there was a significant reduction in the IC50 value from 13.34 μM for the MCF-7 parental cell line. Results also showed that the RR cells developed simultaneous resistance to tamoxifen at clinically relevant doses. Tamoxifen may be given to patients with ER+ breast cancer for 3–5 years following surgery and radiotherapy; if radioresistant cells remain following a patient’s RT course then the efficacy of tamoxifen in radioresistant cells needs to be assessed. Mechanisms for acquired tamoxifen resistance are complex since tamoxifen resistant tumours usually do not lose ERα , with the receptor still remaining functional as demonstrated by cohorts of patients with recurrent disease still being able to respond to secondary endocrine therapy [60, 61]. This has led to studies suggesting that tamoxifen resistance is through modification of ER functionality by growth factor pathways [62, 63]. A previous study using MCF-7 RR cells demonstrated resistance to tamoxifen without a change in ER expression. However, AKT phosphorylation was increased and the investigators suggested that sequential tamoxifen treatment following radiation could be more effective than concurrent treatment . Conversely, results from our study showed that when radiation was delivered 24 h after tamoxifen treatment or ERα knockdown in the MCF-7 cells, an additional decrease in proliferation was observed, suggesting that the use of tamoxifen before and during a patient’s RT treatment may be advantageous. Another study determined that tamoxifen-resistant MCF-7 cells, showed enhanced sensitivity to EGF and oestradiol stimulation. Although ERα was not lost, it was found to redistribute to extra-nuclear sites (cytoplasmic translocation) in the tamoxifen-resistant cells and they suggested that enhanced ERα function, via cooperation with EGFR, is one mechanism responsible for acquired tamoxifen resistance . 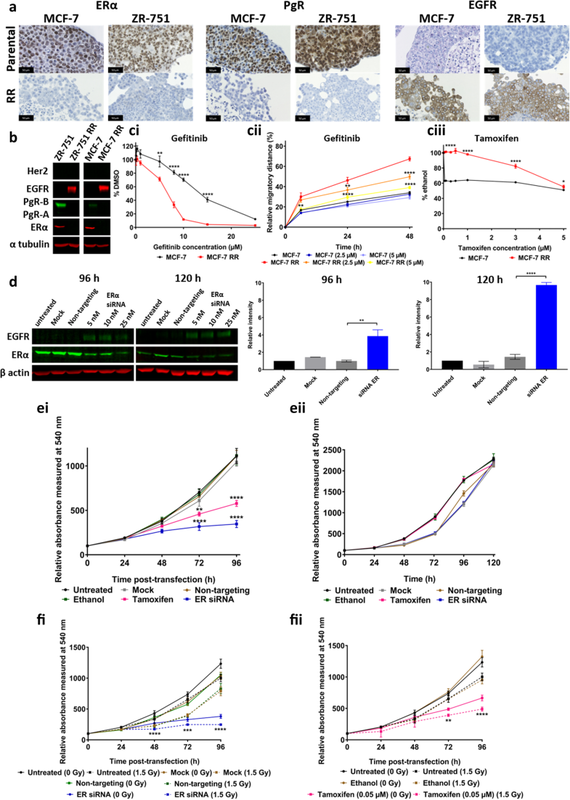 Similar results have also been shown with the establishment of anti-oestrogen-resistant MCF-7 cells, developed through continuous culture in fulvestrant (trade name Faslodex). These resistant cells developed reduced ERα expression and loss of PgR with increased dependence on EGFR/MAPK mediated signalling . Our radioresistant model has shown that ERα and PgR loss occurs with concurrent resistance to tamoxifen which may involve different pathways compared to the development of tamoxifen resistance from chronic drug exposure. This suggests that additional targeted therapy may be required in these cells. 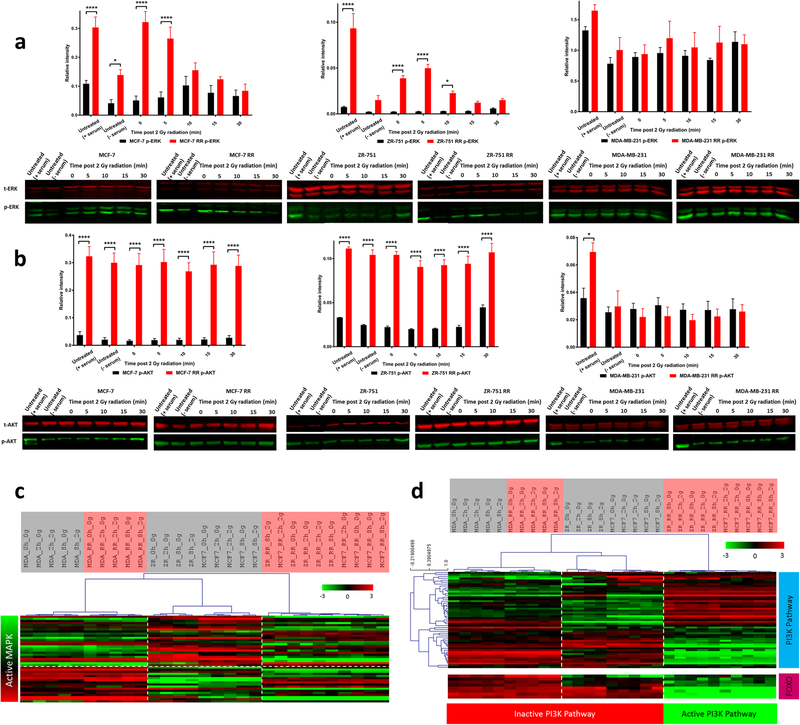 In breast and other cancers radiation-induced proliferation has been linked with activation of EGFR and downstream components of the mitogen-activated protein kinase (MAPK) cascade, including phospholipase-C, Ras, and Raf-1 [70–73] and can be considered an important cytoprotective response . MAKP activation may represent a mechanism by which cancer cells can cause tumour repopulation during fractionated RT courses. 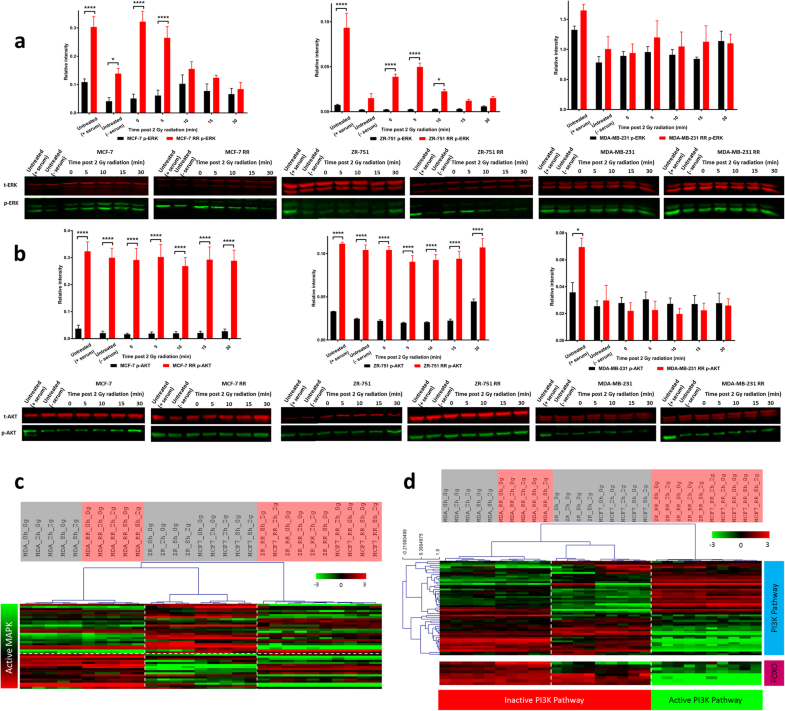 Results from this study at the gene and protein level suggest that MAPK signalling is activated in the MCF-7 RR and ZR-751 RR cell lines since basal levels of p-ERK1 and p-ERK2 were significantly higher than in their parental cell lines and phosphorylation of ERK1 and ERK2 occurred almost immediately following a 2 Gy radiation dose. This radiation-induced phosphorylation occurred more quickly and to a larger extent than in the parental cell lines. 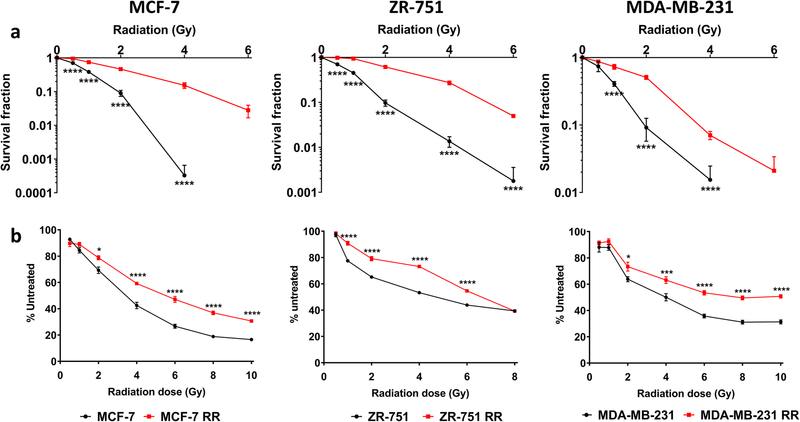 Our results suggest that EGFR signalling, and multiple components of its downstream pathways are activated in the MCF-7 RR and ZR-751 RR cell lines, which could have significant clinical implications, as multiple pathways may need to be targeted to improve the therapeutic response to irradiation.